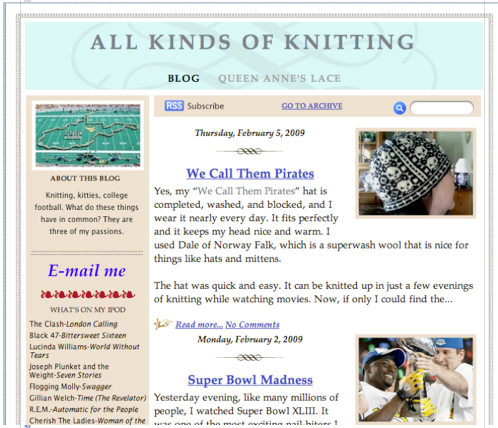 WARNING: This blog entry contains no knitting content. If you love Windows, this blog entry will probably piss you off. Tough! I didn’t have any anti-virus software on the Dell since I let my McAfee subscription lapse once I got my iMac, which doesn’t need anti-virus software. Yeah, I’m gloating. <smiley face> So the first thing I had to do when I connected my PC to the Internet was download an anti-virus program. It’s difficult to find something that’s free and that will work on an ancient OS like Windows Me, but ClamWin is still out there, alive and kickin’. 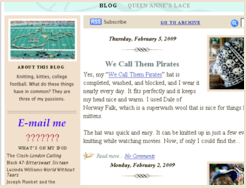 After I got on line, the first thing I did was check out my blog. Yikes! It sure loses a lot in the translation from a Mac to a PC. Many of the characters that I regularly use, such as smiley faces, peace signs, and embellishments, come across in Windows as question marks. I don’t know why this happens. The special characters I’m using are all standard Unicode characters that are also available in Windows fonts. The font I use for my blog entries is Palatino, but I have tried other fonts, such as MS Gothic (MS = Microsoft, right? ), with absolutely no luck. Windows still refuses to cooperate. Below is a screenshot taken on my Mac of what is supposed to be there–those flowery sideways hearts. Here are screenshots of that entry as it appears on my Mac and on my PC. Those infernal Windows question marks are everywhere. Some of my blog entries that included talk of winter weather contain cute little snowmen, and entries pertaining to anything Irish are bound to have shamrocks. But if you use Windows, you probably don’t have a clue that there are snowmen and shamrocks afoot. Instead, you probably are wondering why the hell I put question marks there. Well, I didn’t. Windows did. I hate Windows. Another thing that Windows does is mess up the spacing when I put photos in the text. I’ve pretty much eliminated photos from the body of my blog entries because in order to get them to show properly in Windows, I have to make them look out of kilter on my Mac. It’s annoying to put so much work into something, only to have Windows screw it up. 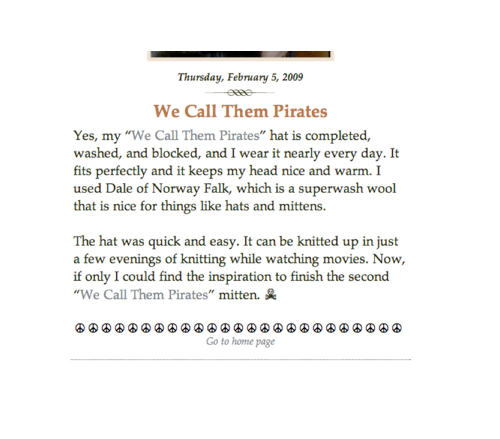 I know that after I upload this entry, I will have to go back into iWeb and adjust the screenshots so that they aren’t covering up text when viewed in stinking Windows and then upload it again.